As part of my Google Glass project to display Infor M3 picking lists on Glass, I had to learn how to easily create picking lists in M3. M3 is a comprehensive Enterprise resource planning (ERP) suite that does customer sales, supply chain, manufacturing, inventory, packing, shipping, accounting, and many other functions. It takes learning and practice to conquer it. I’m a technical consultant for M3, not a functional consultant, so I had to ask for help for the setup to create picking lists. My dear colleagues Philip Cancino, M3 Business Consultant – SCM at Infor in Manila, and Marie-Pascale Authié, Fashion Solution Consultant at Infor in Chicago generously helped me. I recorded Philip’s and Marie-Pascale’s instructions and the final setup, and I’m sharing the results here so you can follow my Glass project along. Watch the videos in full screen and in high definition to see the small details. Also, Philip’s video has audio, and I transcribed it, so you can turn on closed captioning (CC) if needed; the other videos don’t have audio. 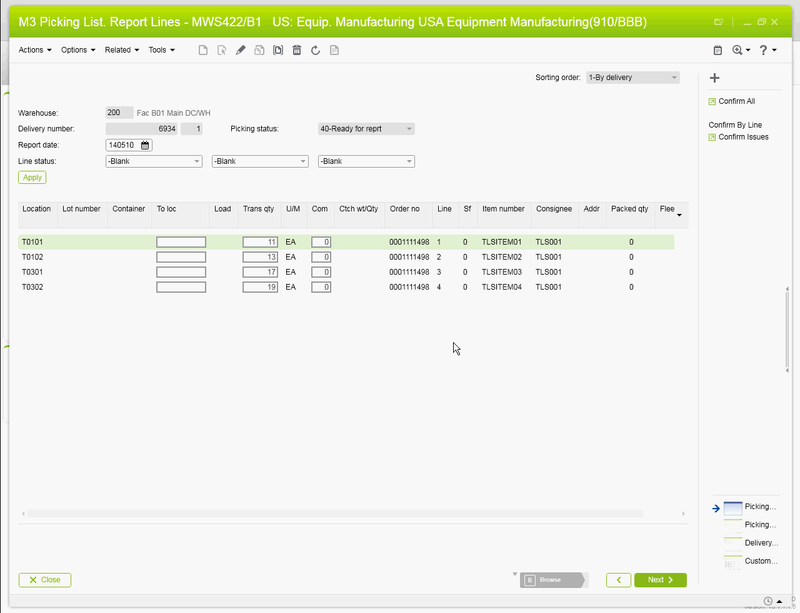 Philip showed me detailed instructions to create a picking list on one of the Infor Education servers that was already setup for Manufacturing, and we recorded a demo. When all the picking list lines have been confirmed, the picking list and the delivery will change to status 90, and the order will change to status 66. After Philip’s demo, I wasn’t able to reproduce the instructions on another server that had a different setup for Equipment service management and rental (ESM&R). So Marie-Pascale helped me setup that other server. She setup everything from scratch, mostly copying from existing records, then going back and forth adjusting what was important for my project until it was working as desired. In panel F I will later set the Geo codes XYZ based on my previous work Geocoding of Stock Locations in MMS010. They are the same steps as Philip’s, except now everything is automatic: allocation and picking are automatic, and there’s no packing nor shipping. We had a problem with automatic allocation though, it failed, and we had to allocate manually in M3 Allocation. Perform Detailed – MMS121. Marie-Pascale said she will look into it. Next, I will capture the event that creates the picking list, and I will gather more information about the Items, like names, and I will send the formatted picking list to Glass. For that, I will use Event Analytics and Infor Process Automation (IPA) and the Glass API. Special thanks to Philip Cancino and Marie-Pascale Authié for making this possible. I wouldn’t have been able to progress without your help. Subscribe to this blog to follow my Google Glass adventures. Comment. Share. Enjoy.